I first heard of Sidhpur about 6 months back when I shamelessly eavesdropped on a conversation while commuting to work by bus. In my defence, the conversation, which was between two women from the Dawoodi Bohra community (as was evident from the colourful ridas they wore) in Gujarati and English, was really loud. It was an animated conversation in which they spoke about their ancestral homes in Sidhpur and the holidays spent there. They spoke of chandeliers, Belgian glass windows, wooden antique furniture, fine linen, tableware, feasts, parties, and antiques among other things. There was gossip, as well as an element of ‘my-ancestral-house-is-grander-than-your-ancestral-house”, but it seemed to be in good fun. The “conversation” on ancestral homes in Sidhpur intrigued me to look for more information on the Internet. Thanks to my good friend Google, I found in Sidhpur mansions with distinctive European style architecture, each one grander than the other. This information was enough for me to include a visit to Sidhpur when I toured North Gujarat in December 2014. It was a little after 4 pm when I arrived at Sidhpur. While asking for directions from a local tea stall, I learnt that the Bohra houses were called Vohrawads and also that I needed to go to the Najampura area, which had the best and maximum number of such houses. A short rickshaw ride later, I was standing in front of the house that you see in the photograph below. The Dawoodi Bohras are a Shia Muslim trading community from Gujarat with a very distinct history and identity. A close knit community, they have a significant presence in Indian cities like Mumbai and Ahmedabad, and East African countries like Madagascar. Like other trading communities in India (for example, the Chettiars of Chettinad in Tamil Nadu, and the merchants of Shekhawati in Rajasthan), the Bohras or Vohras, as they are known locally, invested in and built distinctive and grand residences in their ‘native’ towns/villages after they migrated. Since the community tended to stay together, entire neighbourhoods came to be called Vohrawads or Bohrawads, housing Bohra families. Built in a distinctive architectural style, the Vohrawads are rows of narrow, deep houses, about three to four storeys high, and either along the main street or in a grid like formation. Most of the houses shared a wall with the houses on either side giving a feeling of connectedness. 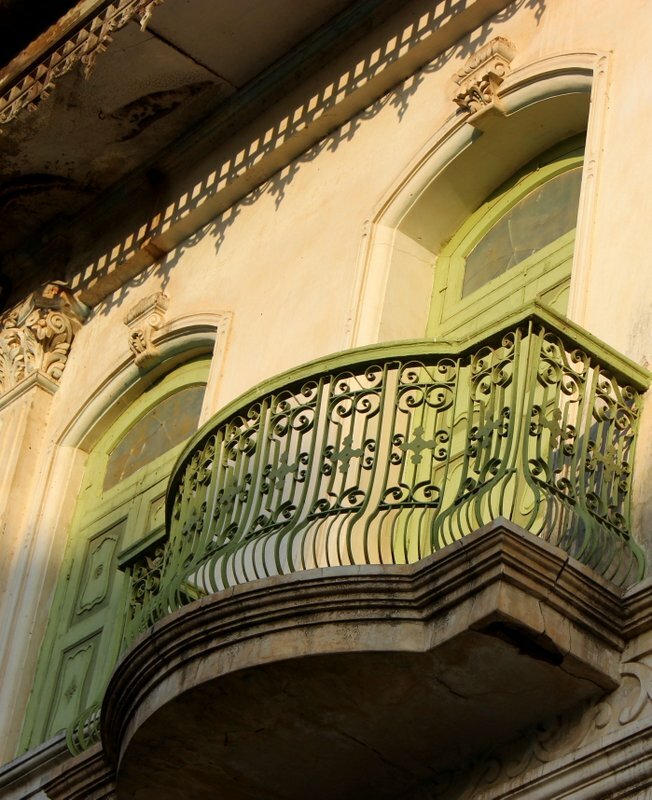 The houses in Sidhpur have a strong European character with gabled roofs, ornate balconies, pilasters, columns and decorated doors and windows. Standing before a row of such houses, painted in a range of colours, a casual visitor could be forgiven for thinking that this was somewhere in Europe and not in a hot, dusty town in Gujarat, India. Like I felt that evening in Sidhpur. Walking through the Vohrawad lanes was a surreal experience. Not just for the architecture, which seemed out of place, but because all the houses were locked and empty. I didn’t see a single resident looking out of a window or opening a door or passing me by. If there were caretakers or anyone living in any of the houses, I didn’t see them. The lanes and byIanes were so empty of people and so quiet that I was keenly aware of the sound of my shoes scuffling on the loose sand and grit on the roads. It took me a while to get used to the emptiness of it all and start noticing the finer details of the Vohrawads. And the monogram / coat of arms outside every house. I was fascinated enough to put together a collage and share them with you here. Much as I delighted in the architecture and other details of the Vohrawads, it was difficult to ignore the fact that they were in a state of neglect. Cobwebs, rusty locks, unswept entrances, rubble piled outside some houses, bags of rubbish outside others… all pointed to the fact that the houses had not been opened or lived in for a long time. I was not just seeing grand mansions, but also the ruins of a different era and time. And I could take a guess as to what must have happened to the Vohrawads for them to have reached this stage. It is a story that can be seen in many parts of our country. The first generation of migrants to the cities would have been the men who left behind their wives and children. Perhaps it was them or their sons who built these grand residences. Family ties would have been strong for them to keep visiting their native towns or investing in them. By the 3rd or 4th generation, the wives and children would have joined the men in whichever cities they were in and that is when the ties would have begun to weaken. As the years and generations passed by, the visits would have grown fewer and gradually the Vohrawads would have reached the stage it has today and then some more. Some of the Vohrawads have been demolished to make way for newer, modern buildings. I saw two such buildings at Najampura and a couple of ‘Sold’ signs as well. Somehow, I was not surprised or even distressed as I know that this change was inevitable. Grand mansions these may be, ancestral homes these may be, a community and national heritage these may be… but at the end of it all they are a valuable piece of real estate, especially since they are privately owned. The sun had almost set when I left the Vohrawad and entered the market surrounding it. The change was dramatic — suddenly people, sounds, colour, vehicles are back … indeed life was back. Even the Vohrawads that faced the market looked livelier. “Why are you taking photographs of dead things? You should be taking photos of living things instead, of people, of life.” Saying this, he shuffled away. Why indeed ! Even after 2 months, I’m still thinking about this conversation. Though I was based in Mehsana and combined the visit to Sidhpur with a trip to Patan, you can easily do it from Ahmedabad as well. There are two excellent articles by Himanshu Burte on the Vohrawads in Gujarat. I strongly recommend that you read them here and here. If you require any further information or assistance in planning a trip to this region, please feel free to write to me as a comment or through the Contact page of the blog. On my wish list since quite some time ever since I read a lovely article about it sometime ago. Great seeing the lovely buildings, wish you could have got some pictures of the interiors as well!!! I wish I could have seen the interiors too, but none of the houses were open and I didn’t see anyone I could ask to open and show the interiors. Apparently, they are quite Indian and I read one account where the author called it Islamic. I did come across one one demolished house whose interiors were visible and it looked like an Islamic design to me. Do make a trip to Sidhpur (and Kapadvanj too if you can) at the earliest for I don’t know how long these Vohrawads will be there. Superb, Sudha! love the post, as well as the photos! and before you told me about it, i hadnt even heard of the place. hope i can go there someday. And the comment about photographing living things is interesting. it makes me realise that i too would rather photograph an old monument or building rather than a new one or people. i wonder why that is… do we indeed live in the past, or want to? Thanks, Anu. You know your comments and feedback mean a lot to me. I knew Sidhpur from the Gujarat Tourism ads with Amitabh Bachchan talking about the place as Matru Gaya. I have to thank those two women in the bus for talking so loudly. Like all places, Sidhpur presented both the expected and the unexpected sides to me. But surprisingly, it is the expected that has set me thinking about monuments, history and heritage more than the unexpected. Thank you, Prem. I have yet to visit Karaikudi or for that matter any other place in the Chettinad region. But I did visit the Shekhawati region in Rajasthan earlier this year in January. Lot of similarities and dissimilarities between the havelis there and the Vohrawads. Will be writing about my Shekhawati trip once I finish the North Gujarat posts. Such impressive structures. Glad to know about Sidhpur! Thanks, Niranjan. Sidhpur is beautiful in a sad sort of way and if you like heritage, particularly urban heritage then this is the place to visit. Lovely. For sure a hidden treasure. The architecture and city layout instantly reminded me of Chettinad, Tamil Nadu. Excellent photos capturing the gorgeous building design elements. Great post and exceptional photography. Many of us just travel well known places but there are lot of hidden treasures which needs to explored more. Welcome to my blog, Aditi. Thank you so much for stopping by and your appreciation. Personally, I feel that every place has something hidden, just waiting to be found and in Sidhpur, this was it. Another discovery through your blog…feel enriched! Had I been in your place, I might have scoote from the place double quick. It looks eerie, spooky and well, haunted by the ghosts of a splendid past. But then, that is why I am sitting and commenting here and you are travelling around and discovering these places for me to read about, right? Go girl! Explore and write about more such places that we don’t even know exist in our country. The Vohrawads did not spook me, but it did make me very, very aware of the emptiness and the loneliness of the houses. I may sound a little silly here, but the houses seemed to have feelings. It saddened me that the houses built with so much love, care, pomp and perhaps even ceremony have reached this stage. Great photograph, i have been to Sidhpur but didn’t seen this beautiful place thanks a lot for sharing this photos. This post is super awesome. Keep writing !!! My appreciation for this sensitively written, informative piece. Enjoyed it immensely. Welcome here, Bharati, and many thanks for stopping by and commenting. I really appreciate it. Sidhpur affected me in many ways as it is a glimpse of times to come as more and more people migrate to cities. YES, recently visited SIdhpur!! its exactly how you have described it here.. extremely beautiful ,yet not maintained..!!! it can be a world heritage site if government takes some steps. While our visit,one of the bohra family even let us come inside their house. Truly its beautiful inside out!! Luck you, Shreya. There wasn’t anybody to see or show us around when I visited Sidhpur. So happy to meet another person who has visited Sidhpur and liked it too. I have been reading your blogs and love them. I was lucky to visit Vadnagar last month. And like you, I too saw the torans during research which I had to see, so I made Vadnagar my first stop of my road trip! I just finished my own blogpost – please do read! Welcome here, Nirdesh. Thank you so much for stopping by and commenting. My apologies for the delay in responding. Vadnagar is such a gem of a place, isn’t it? There’s a part of me which is happy that it still remains relatively unknown; there is also a part of me that screams out aloud as to why more people aren’t going there. I liked your post very much – very comprehensive and detailed. Here are some links with the photographs of the interiors of the houses for those who are interested. Siddhpur is a town developed by the wealthy Dawoodi Bohra Community. Hasanpura is old Siddhpur while Najampura is modern Siddhpur developed by the Dawoodi Bohras by the help of Gaekwad the then ruler of Baroda. The Dawoodi Bohras were and are great philanthropists who true to their pronose to Gaekwad built a town for all communities with school colleges hospitals tower nagarpalika all built by the Dawoodi Bohras. Najampura development started from 1902 when the railway line was installed. Check the Saify Pura Najmi Hall and Yusufi Mahal for its marvellous architecture. Also the 5 bungalows at Totana Park Siddhpur built by the late Khansaheb Esmailjee Hasanbhoy Totanawala. Great article and great photos! I was recently in Siddhpur on a two week tour of Gujuat. I couldnt put my camera away in this neighborhood of the Vohrawads.! Your photos put mine to shame! love the initials’ collage. Also, while the streets were very quiet , there were a few open doors. I ws too shy to ask to enter and have a look.And like you, i met a man, on the street, curious about why I was snapping pix! He was delightful, and glad to meet someone from California–where his son lives. Welcome here, Melloreb. Thank you so much for stopping by and commenting. And I’m so happy to meet another person who loved Siddhpur as much as I did.